Obiano why are you so heartless? Why are you so wicked? First was on 30th May 2016 when you killed our peaceful Biafran citizens during a peaceful protest at Nkpor; as if that wasn't enough, you continued killing our innocent brothers and sisters. On 6th August 2017, you killed Biafrans at St Philip's Catholic Church Ozubulu and you faked up stories that it was a drug war between two brothers but the man you accused said he was innocent of all you said about him. As if that wasn't enough, on 13th August 2017, you killed Biafran people in Assemblies of God Church Onitsha and you lied that it was an attack from Armed Robbers. It is not even up to four days after the Assemblies of God killing, you have killed Biafrans again, today, the 16th August 2017 in Ekwulobia, Anambra State. You are just killing Biafrans because they said there will be no election in Anambra state. The question Obiano, needs to answer is "Do you think that killing Biafrans will make a way for election in Anambra State? Do you think that killing Biafrans will stop them from restoring Biafra? The answer is 'No' because killing them makes people see more reasons why they would not vote for a ritual killer like you and it will make them know the reasons why we must restore Biafra so that nobody will kill us again. You started your killing in the church because you went to a particular Catholic Church to campaign but they all refused to listen to you. That was why you got angry and started killing them from the church because I am very sure no Igbo man will ever kill anybody in the church except a ritual killer like you who is desperate for power. It can still be remembered when you said that IPOB should forgive you for those you killed at Nkpor on 30th May 2016, by the way, it can also be remembered that you denied killing a single soul on that same day. Now you begged for forgiveness which is not yet accepted and you are still killing us and still denying the fact that you killed us. How then do you expect us to forgive you? 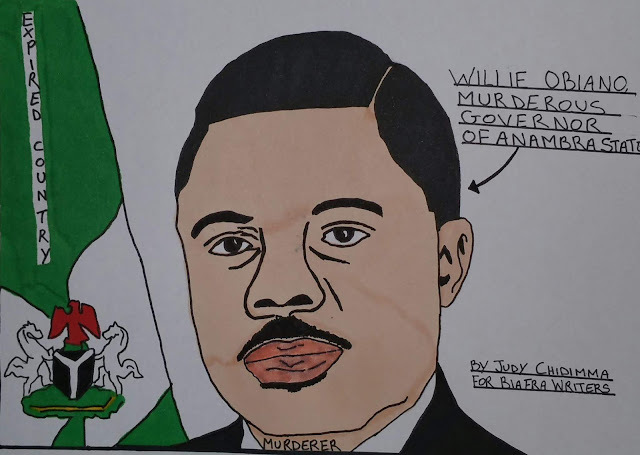 Obiano, you can never be forgiven. Your life will never be at peace since you have decided to always kill innocent people. Chukwu Okike Abiama will punish you and pay you back in a more bitter way, Iseeee!!! Obiano, who do you expect to vote for you and who will be under you if you even win the election? Do you expect the dead to vote for you? Do you expect the dead to vote you in? Obiano be warned. Even if you kill all of us, there will be no election in Anambra State, you will not sit in that position again, Never!!! May the blood of our innocent people never depart from your life, Isee!!!! No Election in Anambra State. No Election in Biafra Land.